Kara Newman's Spicy Cucumber Margarita, made with Ilegal Mezcal Reposado, Tequila Ocho Anejo, and Partida Blanco. Photos by Lush Life Productions. What’s cool, hot, and a total crowd-pleaser? [If you answered “I am,” props to you for being so confident. But no, sweetie, I’m not talking about you.] I’m talking about none other than the spicy cucumber margarita, a drink that I’ve enjoyed variations of for several years at bars in NYC like Los Dados. Any fresh-ingredient bar should be offering this cocktail for this time of year–cool, fresh muddled cucumber paired with a slice of jalapeno, your sweetener of choice, lime juice, and your favorite agave spirit–it’s a simple-yet-invigorating drink that you can have all night. So when Kara Newman asked me last month to participate in her virtual cocktail party celebrating her spicy cocktail book, Spice & Ice, choosing to make Kara’s Spicy Cucumber Margarita was a no-brainer. Cocktail bloggers from all over joined in making recipes from the book, altering them as desired, and then posting pictures and recipes for all to enjoy, at least virtually. And seeing that I love hosting parties anyway, I quickly decided to have a small group of friends over to my Brooklyn crib for an impromptu cocktail jam featuring Ilegal Mezcal Reposado, Partida Blanco, and Tequila Ocho Anejo. I changed Kara’s recipe slightly by using agave nectar instead of Gran Marnier or Cointreau. Although orange liqueur is lovely in this drink, agave nectar allows the essence of the agave spirit to play a strong note–and I was playing with some amazing agave spirits. My friends and I shook up spicy cucumber margaritas using both jalapeno and habanero chiles, and variations using the mezcal and the tequilas. Needless to say, the shakers were rattling all night–my friends, whether cocktail buffs or newbies, couldn’t get enough of the pale green rascals. I offered quick and easy quesadillas stuffed with vegetarian chili and cheese, and the margaritas paired perfectly. It all made for a lovely night, I didn’t have to spend that much, and they were nice enough not to wreck the place. 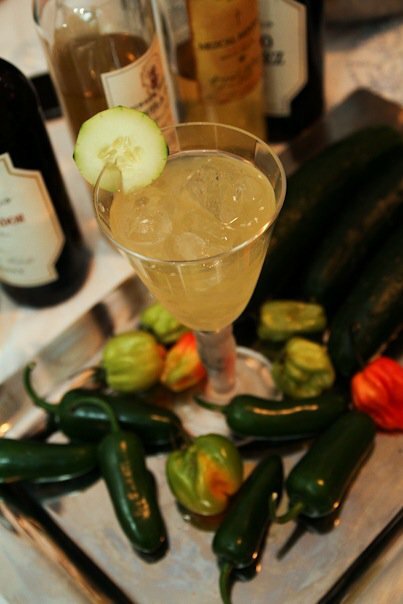 Kara Newman’s Spicy Cucumber Margarita, made with Ilegal Mezcal Reposado, Tequila Ocho Anejo or Partida Blanco. Sipping on spice and ice, very nice! Getting dizzy at the makeshift bar in my crib. My friends are quite spicy. No fan of Gibson martinis will turn down a jar of pickled cocktail onions. And here’s a variation featuring saffron.